A bawdy story of how a poor damsel surrenders her virtue again and again to get to the top of society. 2014 TCM Classic Film Festival to Open with Gala Screening of Newly Restored Oklahoma! After being found wandering the streets of Los Angeles, a severely catatonic woman tells a doctor the complex story of how she wound up there. The US intelligence chief in Europe relates the stories of three different operations that he was involved in with colleagues in Paris and Djibouti, Rome, and Berlin. A medical student becomes obsessed with his faithless lover. Live scenes of Paris and a continuity Narrator link together four dramatic re-enactments of original ballet creations by Roland Petit and his ensemble, Ballets de Paris: Carmen (1949), La croqueuse de diamants (1950), Deuil en 24 heures (1953), and Cyrano de Bergerac (1959). Three separate plans to rob a top-security bank in the western town of Friendly, Texas, circa 1880. 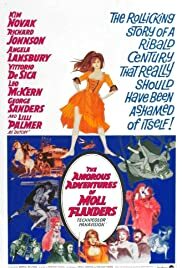 A dictatorial film director (Peter Finch) hires an unknown actress (Kim Novak) to play the lead role in a planned movie biography of a late, great Hollywood star. The life of 1920s actress Jeanne Eagels. A former counterrevolutionary pirate befriends a mentally ill young woman and this in turn leads to tragedy when she falls in love with a French naval officer. Rose Sellars (Kim Novak) is a middle-aged woman who falls in love with a widower (Sir Ben Kingsley). However, his children believe that their father is too old to start a new relationship. Kim Novak looking her best! This movie has to be one that shows off Kim Novak at her most luscious. It's too bad there wasn't enough showcasing! It's also too bad that this movie was made as a COMEDY unlike the newer PBS version. The only consolation, once again, is the luscious Kim Novak.